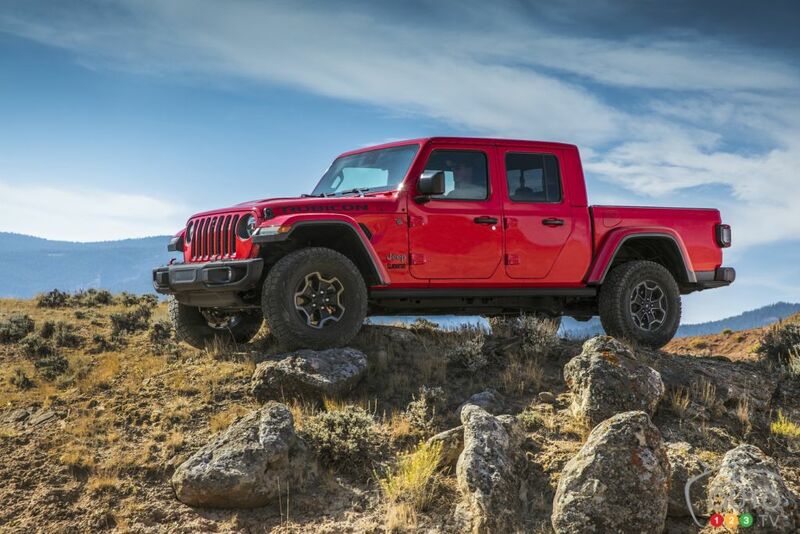 Undeniably one of the star attractions of the Los Angeles Auto Show, the new 2020 Jeep Gladiator is drawing the crowds on the first of two media days at the event. Anticipation for the model has been matched only by the number of rumours and leaks about the model that was for a long time expected to be called the Scrambler. But Gladiator it is, and here are the details. Jeep’s new entry in the pickup truck sweepstakes features the full 4x4 capabilities of the Wrangler, the manufacturer is taking pains to make clear. No compromise is the motto. This means that in addition to that 4x4 system, the Gladiator will feature best-in-class towing abilities, fuel-efficient powertrains, removable doors and fold-down windshield and premium safety features. 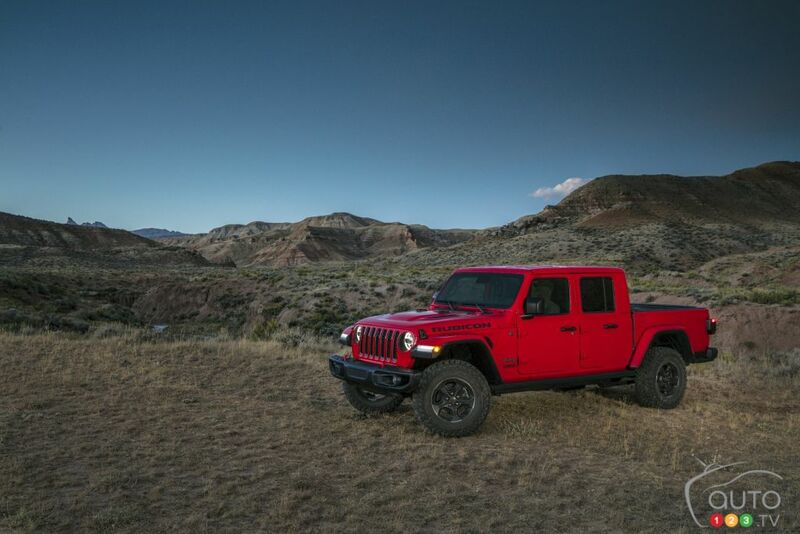 Built on a modified and stretched chassis taken from the Jeep Wrangler Unlmiited, the 2020 Jeep Gladiator leads with the recognizable keystone-shaped front grille and sound headlights, and ends with Jeep’s distinct square tail lights. In between, its contours have actually been worked to improve aerodynamics, there are two hard top and one soft top configurations available for the roof, and the doors, hinges, hood, fenders, windshield frame and tailgate are all made of lightweight but high-strength aluminum for improved fuel economy. 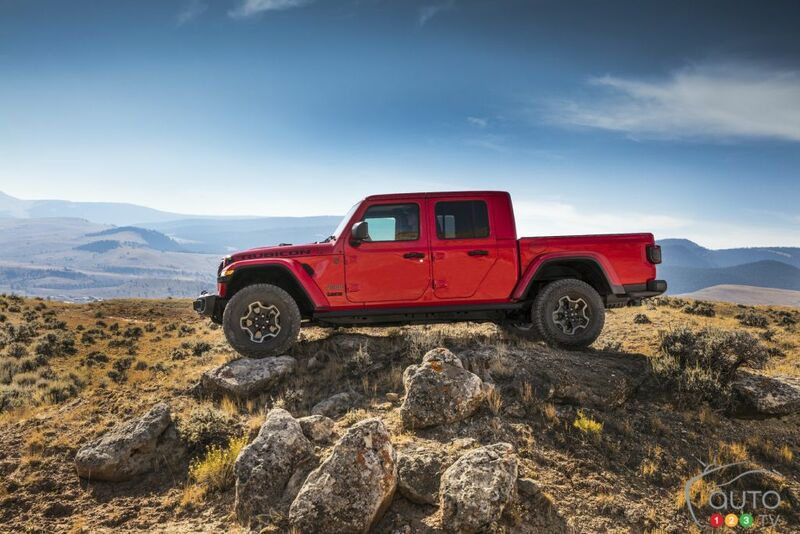 Two engines are offered, or will be, for the Gladiator, starting with a 3.6L Pentastar V6 working with either a 6-speed manual (no surprise there) or 8-speed automatic transmission; output is 285 hp and 260 lb-ft of torque. This comes with stop/start technology as standard equipment. The second will be made available only in 2020, and it’s a 3.0L EcoDiesel V6 with ESS bolted to an 8-speed automatic transmission. The suspension is configured to allow for comfortable on-road driving while preserving all of the off-road capabilities of the Wrangler. 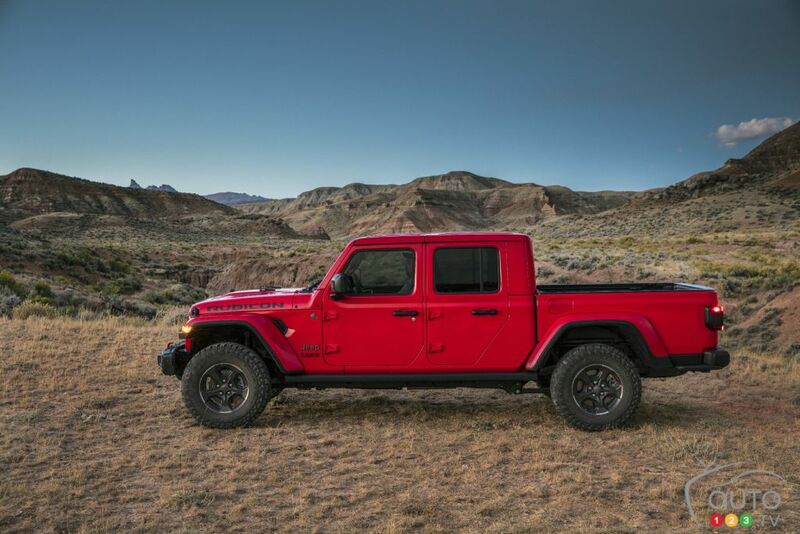 The 2020 Jeep Gladiator is available in four different trim configurations: Sport, Sport S, Overland and Rubicon. The last two of these can be had with optional LED headlamps and fog lamps. Gladiator Rubicon models are equipped with protective cab and cargo bed rock rails. Two-piece body-colour fender flares with a black lower insert are standard on Overland and available on Rubicon models. Gladiator Overland and Rubicon models share an available three-piece body-colour hardtop option, offering a unique, premium appearance, while a black three-piece hardtop, available on Sport and Rubicon models and Standard on Overland, offers even more options for open-air driving. Inside, the Gladiator Overland version’s instrument panel features a soft-touch surface with accent stitching (also available as an option in the Rubicon). The heritage-inspired centre stack features a streamlined form that complements the horizontal dashboard design and sports a distinct finish for each trim. The centre console gets metal-plated accents, while bolts featured on the shifter, grab handles and the infotainment screen’s frame highlight genuine construction methods. Cloth or leather-contoured seats feature accent stitching and adjustable bolster and lumbar support. Available comfort features include heated front seats and steering wheel. The rear seats, meanwhile, are all-new and exclusive to the Gladiator, and feature high-quality premium materials. Two storage nets on the cab-back wall provide additional secure storage space to complement the array of storage solutions found throughout the cabin. The Gladiator integrates the new fourth-generation Uconnect system, which comes with Apple CarPlay and Android Auto integration; buyers can choose from either a 7-inch or 8.4-inch pinch-and-zoom screen. They can also add up to 80 available advanced safety features. The Rubicon edition of the Gladiator will feature a forward-facing off-road camera that offers obvious benefits when navigating through rough terrain. This is a great feature that will helps buyers the hefty price tag attached to the Rubicon edition of the Gladiator (we expect it to hover around $65,000). Functional features like climate and volume control knobs, media charging and connectivity ports, as well as ESS control, are all sculpted for quick recognition and are easily within reach of the front-seat occupants. Inboard and outboard circular HVAC vents are surrounded by a platinum chrome bezel. Jeep is touting the Gladiator as the most capable midsize truck ever built. That’s a big claim, but given the success of the Wrangler and other products over the years and right up until now, it would be foolhardy to bet against it.